The first night out of Taraz, I spent in the small town of Kulan, close to the border between Kazakhstan and Kyrgyzstan. 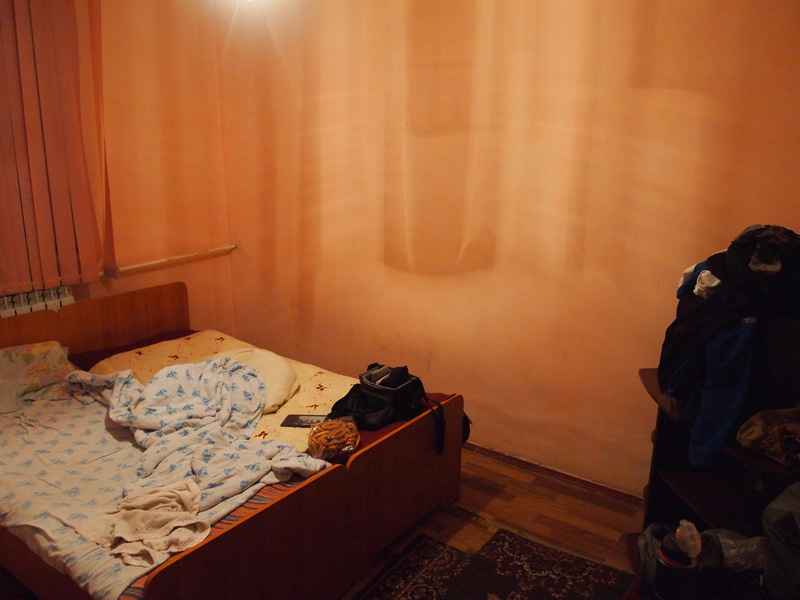 I managed to find a reasonable guesthouse, which was relatively clean but a little bit more expensive than it should have been – especially given that showers were extra and had to be taken in another building. I’ll leave it up to you to decide if I paid. Trying to find an open restaurant in the town for dinner was a bit of a challenge as well. Especially as central Asians towns don’t have the best street lighting or the most even of pavements, that is if you are lucky enough to have pavements to start with. I managed to find something though and was treated to more dubious food. The next day I had been planning on riding as far as I could towards Bishkek, the Kyrgyz capital, and then stopping for one more night before entering the city. Checking googlemaps I realised I was 160km away which is a long days ride but just on the very edge of being achievable given how much light there is at this time of year in central Asia. So I thought I would at least try, I wanted to be in a city again and not have to worry about finding somewhere to stay in rural Kyrgyzstan. I wasn’t too confident as I knew that I had to negotiate a border and roads in this region are very unpredictable. You can be riding on the smoothest of highway for thirty kilometres and then without warning all of a sudden you have a long stretch of heavily potholed track throwing out any predictions for distance you had made. Thankfully I got lucky and the road held together for most of my day and I even made better than average time. Riding up to the border I was hoping for an easy passage through as I had gotten into Kazakhstan easily at the last border and because Kyrgyzstan has a reputation as being an easy country to pass into. My hopes were fulfilled and I had no issue on the Kazakhstan side getting through the border control without trouble and not having to undergo much in the way of a customs check. Passing out of Kazakhstan I was a little nervous as I didn’t have a visa for Kyrgyzstan. While I had read in a lot of places that it was no longer necessary to have one to enter Kyrgyzstan, this didn’t stop me worrying that I’d end up stuck between the two countries or deported off to the nearest airport anyway. Fortunately this didn’t happen and Kyrgyzstan was the easiest country to get into since Europe – easier (and cheaper) than Turkey even. I’m fairly sure looking back a border guard asked me for a bribe when he checked my passport, as usual it took hindsight to make me realise this was the case and by being dumb rather than playing it I managed to avoid paying. It was good to enter my first new country for a month even if it didn’t initially appear much different from any of the other countries I had been in since visiting central Asia. 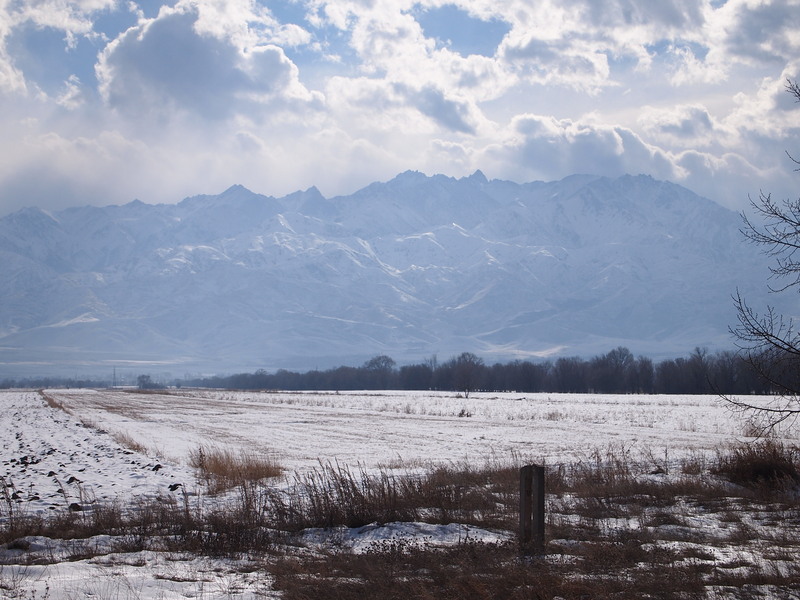 Kyrgyzstan has its own personality though and the most striking thing about it are the mountains. I doubt there are many or perhaps any places you can stand in Kyrgyzstan without being able to see mountains. 80% of the country is covered in them, including some peaks over 7000m high towards the east. So as I rode I continued seeing the Tian Shan mountains that form the border with Kazakhstan from within Kyrgyzstan. The road from the border towards Bishkek was good and I made better than normal time due to either a slight down or a tailwind. I really felt I could make it but knew that I would probably have to ride into Bishkek as night fell. I thought this would probably be OK, my lights are good and riding in cities even in central Asia normally isn’t too bad. So I determined to forge on and passed through the last major town before Bishkek’s outskirts started without stopping. I rode past an inviting guesthouse but figured it’d be better in the city. Then the rain started. In fairness I couldn’t remember the last time it had rained, roughly fifty days ago, so I couldn’t complain. It wasn’t the best timing as it meant visibility dropped a bit more and I had real trouble with my glasses fogging to the point where I just took them off as I couldn’t see where I was going with them. More annoyingly the roads got really wet and slushy and I knew that I would have a really terrible bike cleaning job to deal with in the not so distant future. I was also fairly nervous about other cars as the rain was heavy and the light was failing and telling where the road ended and the verge began was difficult. I was starting to think I really should have stayed in that guesthouse I had seen – but well too late! Getting into Bishkek wasn’t much better as the city was very dark and the roads not very well lit, luckily the GPS was holding up on my phone and I manged to find my way to the hostel that had been recommended to me and that would be my home for the next couple of weeks. 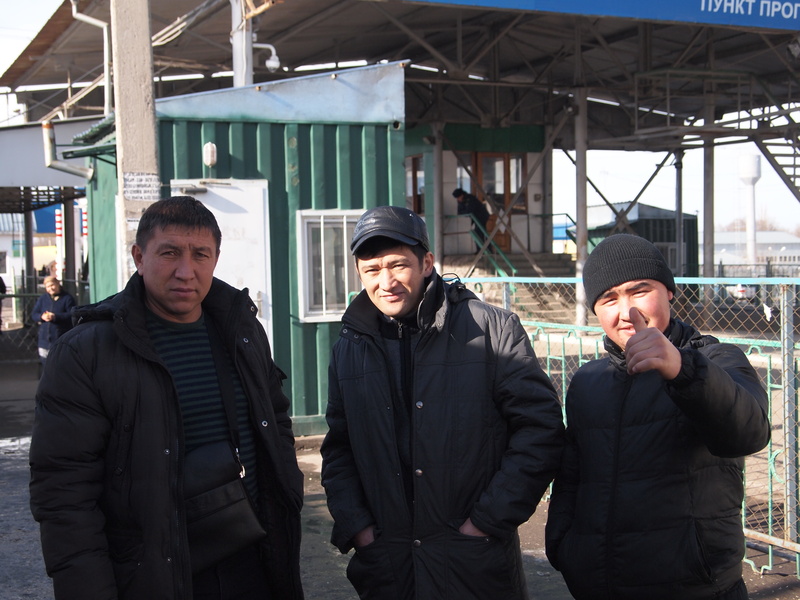 January 26, 2014 in Countries, Cycle touring, Kazakhstan, Kyrgyzstan. No paper maps to guide you, not even as a backup? I have a large scale map of central Asia, which was a gift from another tourer I met. I use it more for checking terrain and getting a big picture though as there are not that many roads in this region.